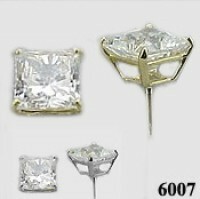 Stock #6007:1 & 2 carat total weight Princess Cut Moissanite Earrings. Gorgeous Stones! in Solid 14k gold or 14k White Gold. Now available with a medium/heavy setting option.